Cognitive health is just as important as physical health, especially following cancer treatment. Depending on your diagnosis you may have had chemotherapy or radiation, both of which may affect memory, concentration, or the ability to perform well in school or at work. These side effects may last for a short time or they may persist for many years following treatment. Additionally, it is important to know that you may not notice signs of side effects from your treatment until a while after treatment has ended. Side effects which occur a few months or even years after treatment are called late effects. Some of the most common cognitive problems survivors report are difficulty with attention, concentration or memory, slower processing speed, and difficulty with organizational skills. Patients often report slow or “foggy” thinking, trouble finishing exams or tasks on time (especially when compared with performance prior to treatment), frequent forgetfulness, or being easily frustrated by assignments and deadlines. Individuals who were diagnosed with a brain tumor, ALL, Non-Hodgkin’s Lymphoma, or an eye/ear tumor are those most often at risk for cognitive late effects. This is because radiation to the brain, ear or mid-facial areas, and total body radiation carry the most risk for causing cognitive problems after treatment. Additionally, in addition to radiation, some types of chemotherapy may carry the risk of affecting memory and focusing as well. If you are concerned that you or your child may be experiencing these types of late effects, it is important to speak with your oncology team to see if they may be related to the treatment you received. There are laws that protect you and provide for accommodations at school and work to help you perform better. Your oncology social worker can help you understand the school and work accommodation process, work with your child’s teachers or your employer, or refer you or your child to a psychologist for cognitive testing to determine which accommodations would be most beneficial. How can I request accommodations in the school setting? If your child is experiencing cognitive late effects in school, an Individualized Education Plan (IEP) or a 504 Plan could be developed to allow accommodations such as extended test time, a quiet place to take exams, shortened school assignments, extra assistance with reading or math skills, notes provided by the teacher, preferential seating in the classroom, or a second set of books to keep at home. It may be easier to get a 504 Plan versus an IEP, but accommodations outlined in the 504 Plan will often not be as specific as those in an IEP. Additionally, there is funding attached to an IEP for a child to receive more in depth accommodations, learning devices, or extra tutoring if needed. It is likely that you will need to make the first request for accommodations to your child’s school, as teachers may not be fully aware of the struggles your child is experiencing. After a request has been made to the school for an IEP, an important step in determining your child’s needs is to have a psychoeducational assessment completed by a psychologist who specializes in testing for school accommodations. 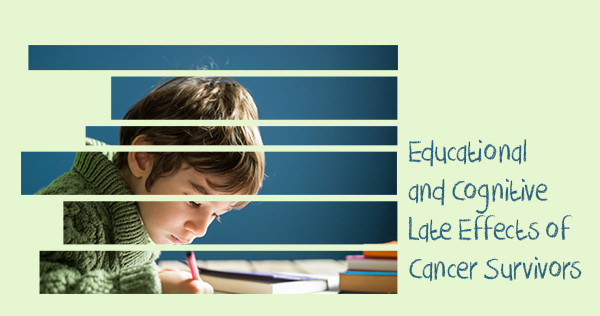 Your child’s school district likely has a psychologist who provides these assessments, however, it may be beneficial to find a psychologist who specializes in working with cancer survivors as they will understand the specific risks your child faces following treatment. Referrals to other providers such as physical or occupational therapists may also be made as part of the psychoeducational assessment process to ensure all needs are met. If your child attends a private school, the IEP laws do not apply for these settings and you will need to speak with your school about accommodations under a 504 Plan. Some private elementary and high schools may be receptive to your child’s specific needs, but others simply may not be able to provide the extra accommodations due to limitations in staffing or funding. This is partially because funding for special education services is distributed differently for private schools than public schools. However, you should still speak with your child’s teachers or principal about his or her needs to see what services they may be able to offer. Keep in mind that a child in a private school setting also has some limited access to resources through the local public school system. If you are in college and feel you need assistance or accommodations, you should speak with someone in the school’s Office of Disability Services about your concerns as soon as possible. This department can assist you with locating tutoring services, scheduling classes, or help you work with your professors to understand your specific needs. Remember that if you are struggling in school, there are many options which may be available to help you succeed and obtain your educational goals. How can I request accommodations in the work setting? There are laws that provide protection for individuals with disabilities in the work setting as well. The Americans With Disabilities Act of 1990 (ADA) and the Rehabilitation Act are two laws that provide protection for adults with both physical and cognitive needs. Often, individuals can continue to work productively after cancer treatment, even while experiencing late effects. Cognitive late effects in the workplace often look similar to those described above: difficulty with memory or thinking, slower processing of information, difficulty with organization or completing tasks. Although the ADA and Rehabilitation Act prohibit discrimination in the workplace, it is important to remember that these laws only cover the employee to the extent that he or she can continue to work in the job given “appropriate accommodations” unless accommodations would “pose an undue hardship on the employer.” Appropriate accommodations may include frequent rests or breaks during the work day, adjusted work schedules, extended time to complete larger projects or a reduction in quarterly production goals. However, appropriate accommodations are not clearly outlined in the law and the law does allow for some discretion by the employer. In general, however, if you can complete the job requirements outlined in your job description with a few accommodations, these accommodations should be provided and allowed by your employer. If you have questions about work accommodations or how to discuss your needs with an employer or manager, an oncology social worker can help with your questions, advocate on your behalf, locate other resources, and make referrals based on your needs. Remember, if you are struggling at work after treatment, it is important to begin a conversation with your employer as soon as possible to prevent your employer from misunderstanding changes in your work performance. Previous PostPrevious Cancer Diagnosis? Know Your Options!